You are here: Home / Featured / Family / Filipino Misua Soup made with @CanadianBeef on #Manitoulin? Filipino Misua Soup made with @CanadianBeef on #Manitoulin? Although I was born and raised in Canada (born in Toronto, raised in Montreal), Filipino culture is a large part of who I am. What I love about my mother’s culture is the joie de vivre, the family togetherness, close-knit ties, and of course…the food! For Filipinos, food is at the centre of every social event. It’s all about the food. Food is nourishment. Food is for sharing. Food is love. That may sound a little odd, but it’s all about celebrating with loved ones. If you go to a Filipino home, I guarantee that “tita” (auntie) or “lola” (grandma) will try to ply you with food. It is impossible to go to a Filipino home and not get offered something to eat! It’s part of the custom. My husband and daughter, both as non-Filipino as you can get, both LOVE Filipino food. I was going to make meatballs and spaghetti at my daughter’s request, but then she changed her mind and wanted Misua Soup. Ever since she was a tiny tot, Misua Soup has been one of her favourites. I did things a little differently since I don’t have all the right ingredients on the Island. 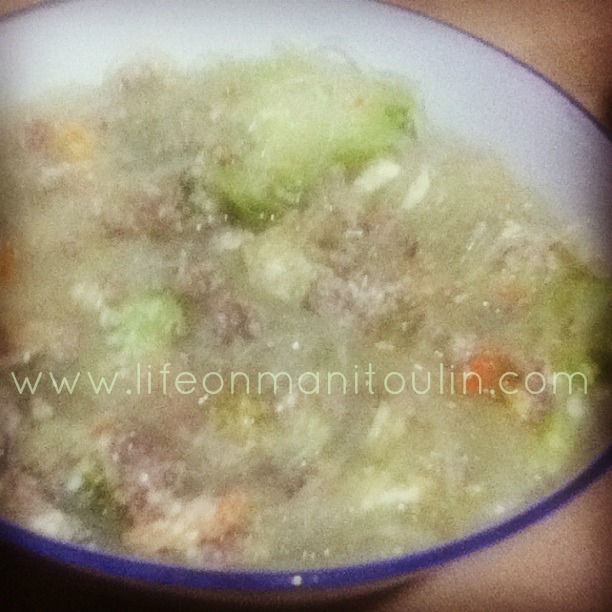 Check out my recipe for Manitoulin Style Misua Soup on the Canadian Beef Blog! Proud to be a Canadian Beef Brand Ambassador! Connect with them on Twitter, Facebook, and the Beef Blog! OMG, my MOM also wears polka dotted shirts for New Year’s!!!!! She never made us do it though. Bert’s mom used to hang up grapes from the dining room chandelier, then forget about it. It would turn into a bunch of dusty raisins, ha ha! So awesome! That’s how we normally celebrate NYE with my mom’s family…everything circles for prosperity. We also dress in outfits that have circles in the design. HAHA! I remember one NYE when I was a tween. I had a silver and white dress with the bottom being sort of like those bubble skirts and it had black polka dots on it! Hi C – For New Year’s Day, my mom made misua soup with meatballs (Almondigas)…it’s a tradition with her to have some sort of soup with round objects, which symbolize money or prosperity. We had grapes and organes at the dessert table as well as kutsinta (steamed brown sugar rice cakes) and palitao (round rice cakes with coconut and sugar).